Project maps allow you to display and analyze a journey from a perspective. For example, a "customer view" allows you to see the map from your customer's perspective, while a "marketing view" allows you to view the map from your marketing team's perspective. Having a variety of views in your project enables you to experience a journey from different angles. The picture below is an example of how you can use views to filter information. In this view, you will only see what Emotions (rows) the customers have when using each Channel (columns). Ultimately, Maps enable you to see more details that can be improved by displaying only touchpoints that are relevant. 1. On the left panel, under views, click ‘Add Map’ icon. 2. A popup will appear asking for information. Type the name of the new view and the layout. 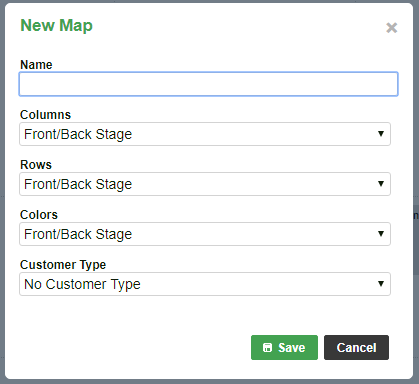 Name: short descriptive name such as "View by customer"
Colors: select one project field that will be used to filter the touchpoints that are displayed for this map. Customer Type: select the Customer Type from the list. 4. The drop down list under your Project Title (upper left of the screen) is updated to include the new map and the page will automatically refresh to show the new map. To switch maps, simply click on the project title.